As discussed in the blog post of March 3, 2014, Leslie Bush and I recently joined Phil Dering as members of the Ancient Southwest Texas Project archaeobotany team. 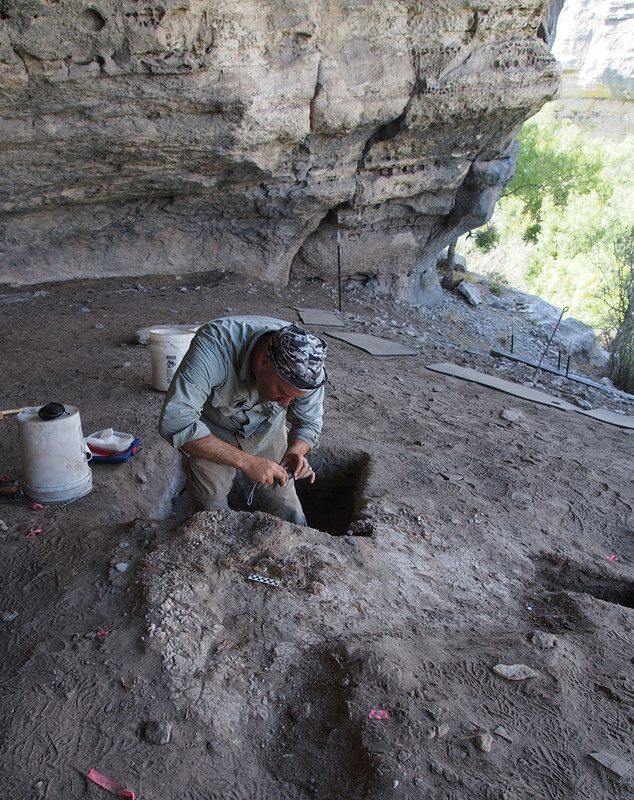 Our role is to study the massive amounts of well-preserved plant remains that are expected to be found in Eagle Cave, Kelley Cave, and Skiles Shelter. And we have not been disappointed! While excavations and the analyses are ongoing, the bulk matrix samples we have looked at so far are overflowing with fascinating perishable materials reflecting the prehistoric inhabitants’ use of local plants for artifacts, fiber, and food. In early May I returned to Eagle Nest Canyon to assist in the excavation of a remarkable plant processing feature in Kelley Cave. When first encountered by Dan Rodriguez and Steve Black last summer, Feature 4 appeared to consist of a thick fiber layer capped by a uniform and seemingly purposeful layer of alluvial mud about 3-5 cm thick. They hypothesized the mud layer was a prepared surface, presumably created by dumping basket loads of fine Rio Grande alluvium like that found in a flood deposit in adjacent Skiles Shelter. 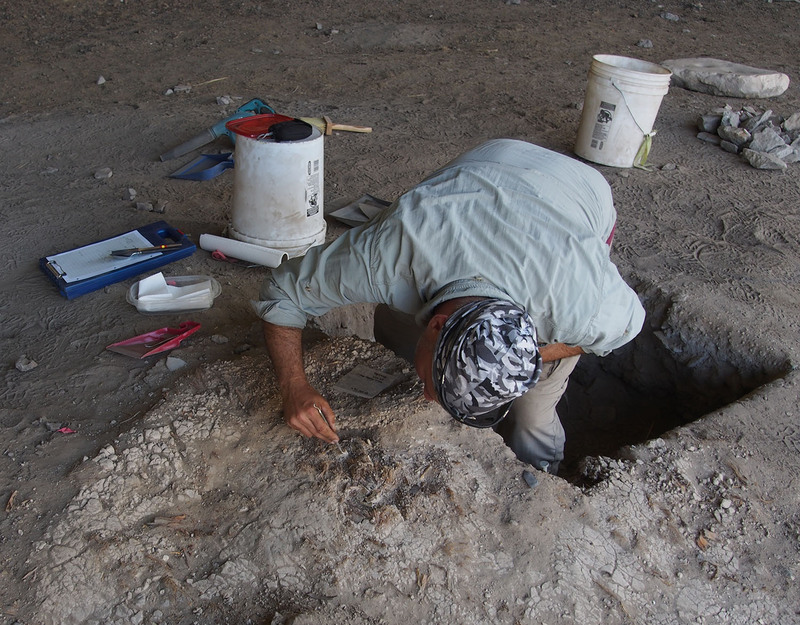 However, sediment size analysis and comparison led geoarchaeologist Charles Frederick to favor an alternative idea: that the layer is a naturally deposited thin mud drape from the same impressive flood that left an alluvial layer over one meter thick in the back of Skiles Shelter. This fits with the fact that Kelley is some 5 meters higher in elevation than Skiles. A tentative assessment of new radiocarbon dates from both sites suggests this extraordinarily massive flood may have occurred around AD 1350. Kevin Hanselka pointing to cord-wrapped bundle when initially exposed. My interest in Feature 4 is in its layers of plant matter and the information they may contain about the cultural use of plant resources in the shelter. In other words, as Brooke Bonorden so eloquently stated in the March 3rd blog post, I want to assess these deposits for “… well-preserved evidence of full behavioral chains from plant collecting to baking to food consumption to fiber production to weaving and plaiting to finished object to final discard.” Most of the plant remains from Feature 4 probably represent the accumulation of waste products of food prepared in nearby earth ovens. Mainly trimmed-off outer leaf bases from baked agave lechuguilla stems or “hearts,” but also discarded agave quids (masticated inner leaf bases) and other plant remains such as wild onion skins. The food remains, however, may also be intermingled with manufacturing waste produced as leaves were stripped into fiber for weaving mats or baskets or for twisted twine. Kevin using dental pick to gingerly free the artifact from the mud and fiber in which it was embedded. Steve and Dan’s working hypothesis is that the Kelley Shelter occupants cooked plant foods such as lechuguilla, sotol, prickly pear, and wild onion in earth ovens near the mouth of the shelter, and then discarded the waste vegetal debris in dense layers, like that in the upper Feature 4. A desirable side effect of this patterned behavior would be that plant layers would help suppress dust, making the shelter a more comfortable place to live and work. We have been kicking around these ideas for several months and Steve had promised he would wait until I came back in early May to further explore Feature 4. Hanselka takes photos of his handy work. 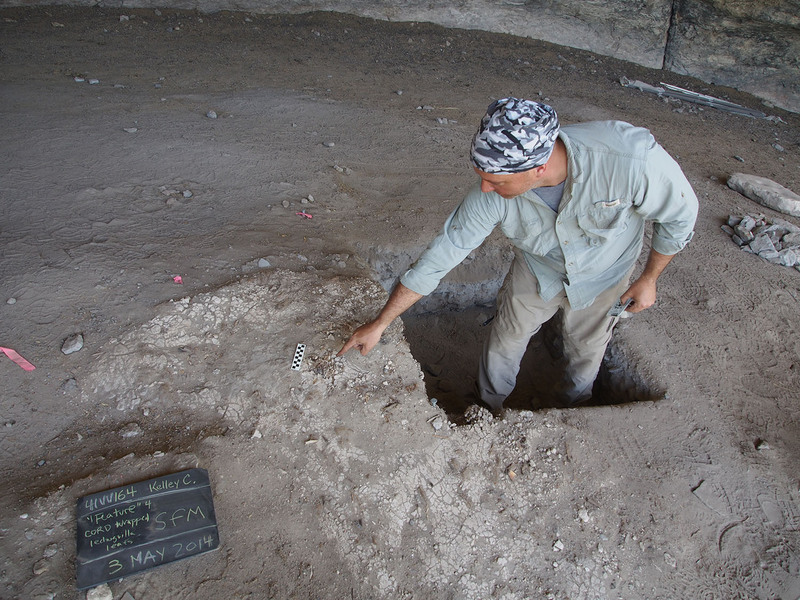 And so it was that Steve, fellow visiting archaeologist Drew Sitters, and I began to excavate a 50-x-100 cm unit placed just downslope (west) of the previously exposed mud-capped fiber layer in hopes of encountering buried cooking facilities just inside the shelter drip line. After removing the disturbed surface layer and remnants of the mud drape/surface and exposing the underlying fiber layer (along with some scattered small burned rocks), we paused to thoroughly document the exposed layer using Structure from Motion (SfM) photogrammetry, as described by Charles Koenig in the January 23rd blog entry. While Steve and Drew took the photos, I busied myself with closely examining the floor of the shelter for interesting perishable artifacts. 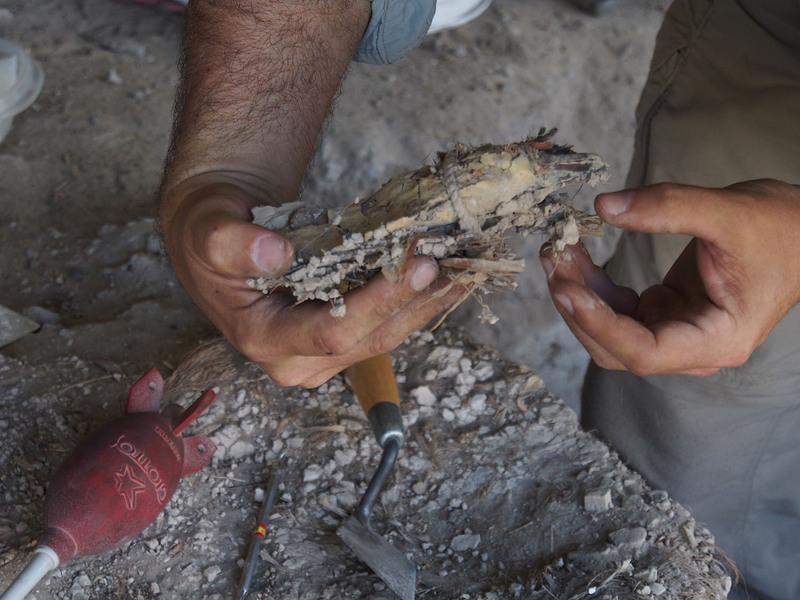 From my previous experiences in similar sites in Mexico and New Mexico, I know that tiny textile fragments, cordage, and unusual plant parts are often found just lying about the surface in dry rockshelters. Again, I was not disappointed. In the middle of the previously exposed area of Feature 4 I noticed a small loop of tightly-wound fiber cordage protruding from the dust. Based on the coarseness of the strands, I tentatively interpreted it to be made from twisted lechuguilla leaf fibers. Carefully blowing and brushing away the surrounding dust revealed that the cord was exposed in a drying crack of the mud surface and that in seemed to be encircling a fibrous mass of what appeared to be lechuguilla leaves, and was tied in a simple knot on top. However, the exact nature of the artifact was unclear because it was embedded in the hardened mud drape atop the thick upper fiber layer of Feature 4. As I later learned, Dan had spotted the same embedded cord last summer when the mud surface was first exposed. He had left in place to be looked at more closely as the feature was more thoroughly documented. In the intervening months the mud cracks had widened such that I could see the cord was wrapping something. Given that Dan and Steve had thoroughly documented the upper part of the feature exposure using SfM, Steve authorized me to expose the object in order to thoroughly document it before removal. Although most of Feature 4 will be left unexcavated and carefully protected for the future, Steve decided the collection of the specimen was justified. Such perishable artifacts are extremely rare in the archaeological record except under the best preservation conditions, and because it will be vulnerable to future destruction by foot traffic in the shelter. While human visitors can be encouraged to avoid sensitive areas of the site, feral hogs are known to frequent the shelter and wallow out sizable depressions where they sleep. As all experienced archaeologists know, a time-honored rule in fieldwork is that the most interesting finds will most often occur in the last hours of your last day in the field. As it happened, I discovered the artifact about an hour before the end of the work day on a Saturday, and the crew takes Sunday off. What is more, I was scheduled to return home to Austin the next morning, so literally the find was made in the final minutes of my planned field visit before I had to leave Eagle Nest Canyon. Rather than trying to stay late with the entire crew waiting around for me to finish exposing and removing the artifact (knowing that it would take some time), Steve and I elected to call it a day and return refreshed and alone the first thing the next morning. Exposing and removing the artifact was a delicate and tedious process, and ultimately took several hours. Although it is well-preserved, the fibrous mass and cordage are very fragile, and they were firmly embedded in the mud drape. In fact, the cord-wrapped bundle’s mud encasement is probably what protected and preserved it so well in the first place. I worked to remove it hunched close to the ground, using a dental pick and tweezers (and occasionally the pliers on my multi-tool!) to carefully break up the hardened mud and separate it from the cordage, fibers, and thin fragments of prickly pear leaf epidermis (the “skin”) encircling the bundle. I constantly alternated between picking and tweezing and carefully brushing/blowing away the resulting debris. Meanwhile Steve photographed the action, took notes, and lined a plastic container with paper towels in which we would cradle the artifact once it was freed. Kevin lifts bundle out from where it has rested for 650 years. 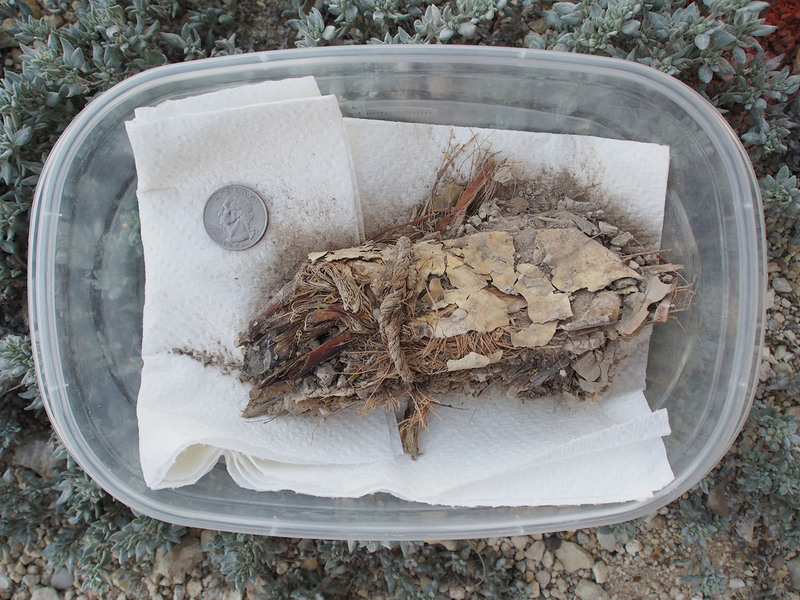 The revealed artifact proved to be a short “bundle” of fibrous leaf material and a desiccated prickly pear pad bound with a short length of fiber cordage that had been tied into a simple knot on one side. 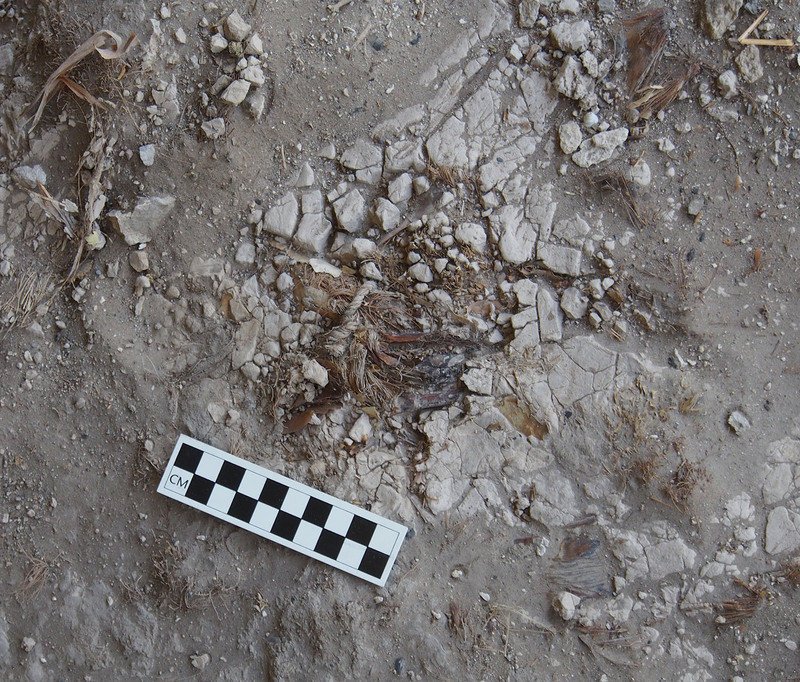 Overall, it was less than 20 cm long and was found to be on top of two additional fragmentary prickly pear pads within the dense vegetal layer in Feature 4. The item must have been sitting on top of the fiber layer when the massive flood event deposited the sheet of mud that then hardened around it, encasing it and preserving it for us to find centuries later (although this is only our preliminary interpretation). Steve took several rounds of SfM photographs as the artifact was exposed and cut free. The artifact was finally removed by severing the extraneous fibers and leaf fragments that clung to it and fused it to the vegetal layer below. We gingerly lifted it out and carefully put it in the box. Cord-wrapped bundle awaits further investigation. Perishable items such as this more than likely comprised the vast majority of the material culture of the indigenous hunter-gatherer populations who called the Lower Pecos Canyonlands home. But most perishable artifacts are simply no longer observable in the archaeological record in most settings. They aren’t preserved in open campsites and, sadly, over the past 80 years most of the rockshelters of the region have been dug into by artifact collectors. The mere fact that this simple artifact has survived the centuries to be discovered and studied is testimony to the spectacular preservation conditions in the Eagle Nest Canyon shelters, and the rare window they provide into the daily lives of the ancient inhabitants of the Lower Pecos Canyonlands. Once again we must tip our hats to the Skiles family for their stewardship of the canyon. [Postscript by Steve Black: We have enjoyed showing the curious cord-wrapped bundle nested in its box to our volunteer and visiting archaeologists. Several have put forth interesting ideas. Steve Davis pointed to the fact that the leaf sections protruding from one end of the bundle are charred, and suggested the object might be some sort of torch. Carolyn Boyd reminded me in many ethnographic accounts from Mexico and the Southwest bundled plant materials were burned to create smoke during rituals. Elton Prewitt pronounced that the prickly pear skin visible within the bundle is part of a prickly pear pouch containing quids and leaf bases. Amy Reid made the excellent suggestion that we get the artifact x-ray CT scanned before dissection. All these ideas are being pondered and I expect the bundle has more than one secret yet to be revealed. An excellent read for a Monday morning. I agree, do an xray. Keep us posted on what you find — I’d love to talk to you about it and write about this for Western Digs when you’re ready. Thanks and keep up the great work!